‘Echinacea’ refers to a genus of the Asteraceae family commonly known as purple coneflowers. There are nine known species in the genus, the most common being E. purpurea, E. angustifolia and E. pallida. The echinacea species are native to much of Northern America with locations varying by species. Echinacea was the most widely used medicinal plant of the Plains Indigenous Americans with a total of 19 tribes having been documented using Echinacea plants. Of these, E. angustifolia is the best documented. 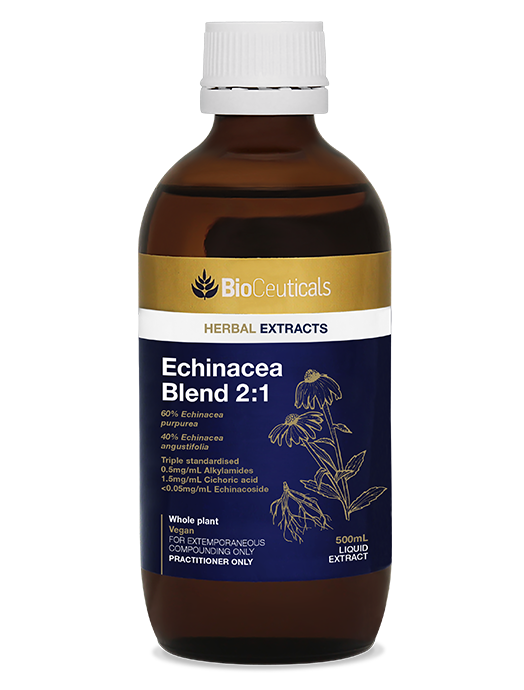 Perhaps due to its widespread popularity with the native healers of Northern America, the Eclectics praised echinacea, applying it to a variety of conditions. High-quality echinacea preparations have a distinctive fiery, pungent flavour and a slight mouth-numbing effect. Triple standardised to alkylamides (0.5mg/mL), cichoric acid (1.5mg/mL) and echinacoside (<0.05mg/mL). Solvents: 48% organic cane ethanol, 52% mountain spring water. Recommended dose: 5-10mL per week. 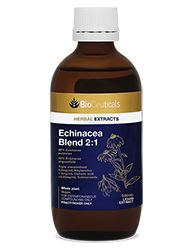 For further education and research, refer to the BioCeuticals Echinacea Blend Monograph.